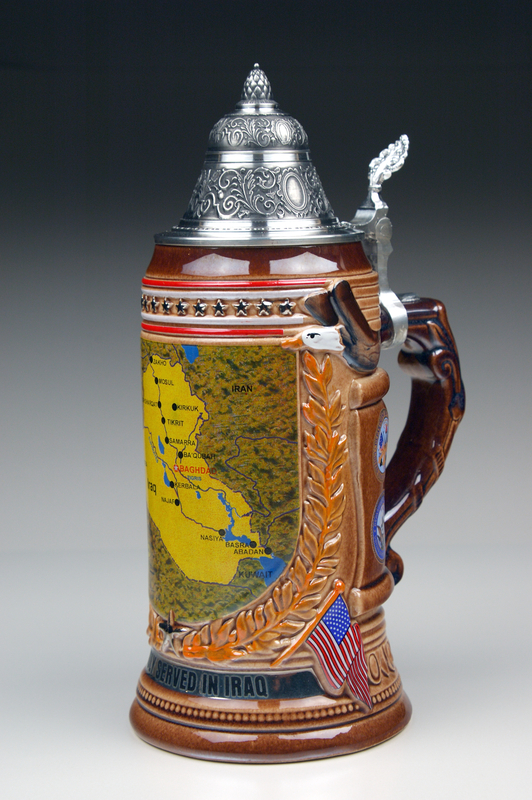 This magnificent 0.75 liter specialty stein is "Made in Germany" by King Werke and was created as memorabilia for our troops who served in Iraq. This stein is issued as a 10,000 piece LIMITED EDITION and is now available in limited quantity. The stein features the Map of Iraq, showing the major cities: Abadan, Basra, Nasiya, Najaf, Kerbala, Baghdad, Ba' Quban, Samarra, Tikrit, Kirkuk, Rutba, Ash Sharwat, Mosul and Zakho. The map is framed by a rich relief showing the American eagles and a banner reading "PROUDLY SERVED IN IRAQ". The side panels have the seal of : Department of the Navy, Department of the Army, Department of the Airforce and Marine Corps. The stein is topped with a pointed full pewter lid, decorated with rich relief.